Social media is a security and risk nightmare, exposing companies to information security, regulatory, and reputational risks. But you now have help in protecting your company when it chooses to embrace social media. A November, 2012 Forrester report, Manage the Risks of Social Media, provides guidance for you to understand the ways in which social media exposes your organization, and then establish a plan to appropriately control and monitor it. 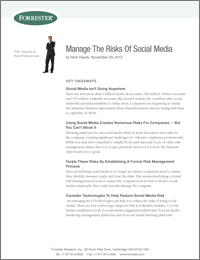 Download your complimentary copy of Forrester's Manage the Risk of Social Media today!